Add more than style to your home. 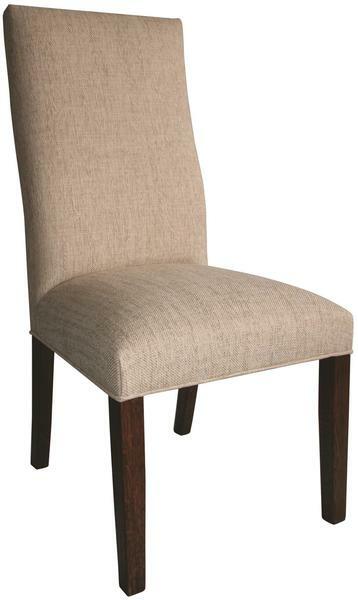 With the Amish Hudson Dining Chair, you will add quality craftsmanship and comfort to your meals! The Hudson Upholstered dining chair has a slight curve on the lower section of the back to provide lower back support while you wine and dine at the table with family and friends. Select your choice of fabric. Match the seat with the back or combine two different fabric patterns to make a unique look for your dining room. Select your choice of solid wood for the arms and legs of the Hudson Upholstered Dining Chair: solid Oak wood, solid cherry wood, solid brown maple, solid quarter sawn white oak wood, or solid hickory wood. Finish the look of your new dining chairs by selecting the stain of the legs and arms. Match it to your current table with the help of our furniture specialist today! Our furniture is proudly made in the USA! Height from Floor to Back: 40 1/2"
Height from Floor to Arm: 25 1/2"